Pinch valves used for fluids usually employ a device that directly contacts process tubing. Forcing the tubing together will create a seal that is equivalent to the tubing's permeability. Pinch valves are typically used in applications where the media needs to be completely isolated from any internal valve parts or entrapments. They are commonly applied to medical instruments, clinical or chemical analyzers, and a wide range of laboratory equipment. Major components of a pinch valve consists of body and a sleeve. The sleeve will contain the flow media and isolate it from the environment hence reducing contamination to the environment. Generally used for slurries or processes with entrained solids, because the flexible rubber sleeve allows the valve to close droptight around solids—solids that would typically be trapped by the seat or stuck in crevices in globe, diaphragm, butterfly, gate, or ball valves. The sleeve material can be selected upon the corrosiveness and abrasiveness of the flow media, a suitable synthetic polymer can be chosen. A pinch valve may be the best type of valve for flow control application if the operation temperature is within the limit of the polymer. Air-operated pinch valves generally only consist of an extremely elasticised reinforced rubber hose, a type of housing, and two socket end covers or flanges. The rubber hoses of the air operated pinch valves are usually press-fitted and centred into the housing ends by the socket end covers or flange. Since they function without any additional actuators, all they need to close or operate is a pressurized air supply into the valve body. As soon as the air supply becomes interrupted and the volume of air exhausts, the elastic rubber hose starts to open due to the force of the process flow. The most important benefits of using air-operated pinch valves are their complete and true full bore, and are 100% tight shut off – even on solids such as granules, powders, pellets, chippings, fibres, slivers, any kind of slurries and many more aggressive products. 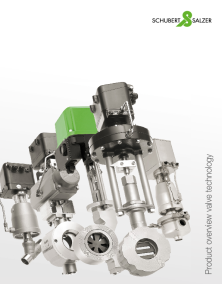 Usually conventional valves such as ball valves, piston valves or gate valves tend to fail when in process with the above-mentioned aggressive products. The reason is that the valve body seat or the gate/piston of the valves wears out too quickly and the valve can no longer shut off tightly, whereas air-operated pinch valves work without almost any wear of the elastic rubber hose because the kinetic energy of the solids are absorbed through the extremely high elasticity of the rubber that also helps to resist abrasion. Pinch valves also provide true full bore, eliminating fluid flow-resistance. On a smaller scale, pinch valves are used in some water pistols, notably the original Super Soaker 50.